The Chemical Guys All Clean+ will clean away dirt, grime, and stains from virtually any surface! Literally you can use this product just about anywhere inside and outside the vehicle. 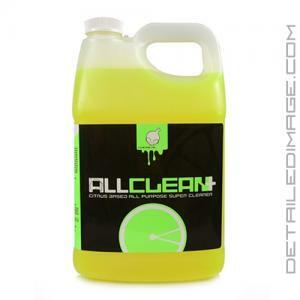 Use All Clean+ on your tires, plastics, rubber, carpet, wheels, door jambs, engine bays, fabric seats, headliners, floor mats, etc. Simply dilute it to 10:1 ratio for exterior cleaning and 20:1 for interior cleaning. So one 16oz bottle can make over 350 ounces of cleaning solution! The secret behind All Clean+'s cleaning power is in its natural citrus extracts from limes. These gentle yet powerful citrus extracts are the active cleaning ingredients behind this formula, instead of harsh chemicals. When using the formula it will break the bond between the contamination and the surface, allowing you to easily remove grease, human oils, juices, road grime, dirt, and tar. For stubborn buildups let All Clean+ dwell for a few minutes then agitate the problem area with a brush or sponge. This advanced all-purpose cleaner (APC) allows for endless detailing possibilities and if you are looking for an all around cleaner that can still handle the dirtiest of jobs then the Chemical Guys All Clean+ is perfect for you. All-Clean+ Citrus based all-purpose cleaning formula designed to clean any surface quickly and easily. The advanced cleaning formula works on virtually any surface both interior and exterior. The all natural citrus based formula is designed to remove dirt, grime, stains, and debris faster than ever imagined. The professional strength biodegradable All-Clean+ removes stains and odors with the cleaning power that professionals demand. Works by attacking the dirt and grime to pull away stains exposing a clean surface. Now any surface can be free of dirt and stains with the powerful cleaning action of All Clean+. Works on everything from stained carpets to dirty tires. All-Clean+ works wonders on tires/trim, plastics, rubber, carpet, wheels, door jams, engines, and undercarriages by eliminating grease, grime, dirt and tar upon contact. It's Always recommended that you rinse the surface area off with plenty of water to loosen dirt grease. Spray on, touch stubborn spots and allow time to clean. If necessary rub with a sponge or brush. Rinse off with a sharp steam of water. I use this on my cars as well as inside my house! Wheels, tires, upholstery and carpet! I had to buy the gallon size since I go through so much. Love this stuff. Used it to remove tar from clear coat, clean carpet, rubber floor mats and some wicker furniture so far. Goes a long way. This CG product had my interest peaked since I'm always looking for a good APC. I tried the product with both dilution ratios and I like it. I used the 10-1 on a spot in my carpet inside the house. I had a spot that would not go away even though I used various products. This finally did the trick! As another thumbs up for this product, I had forgotten that I had a pump spray bottle filled with a organic gardening product. The stuff had settled in the bottom and when emptied, there was a thick layer left behind. I tried numerous cleaning products to see if I could get the residual out but had no luck. So, I took some of CG All in one citrus, added two ounces to 15 ounces of hot tap water, and let it sit over night. The next day, I emptied the contents and rinsed with hot water. I'm happy to say the bottom was clean and smelled much better. I will be ordering more of this product for my APC. Oh yeah, the 10:1 does agreat job for cleaning tires. The level of customer service simply cannot be beat. You have me as a customer for life!